Vegetables play an extremely important role in human nutrition. Nutritional value of vegetables is determined by the high content of carbohydrates, organic acids, vitamins, active elements. Ingredients: Tomatoes, pepper, aubergine, salt. Store the opened jar in the fridge. Eggplant caviar is not only delicious, but also useful, because eggplant is beneficial to health – eating eggplant reduces cholesterol in the blood, liver, kidneys. 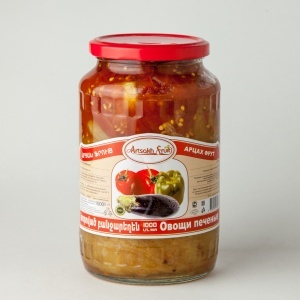 In addition, eggplant caviar is rich in vitamins and trace elements. 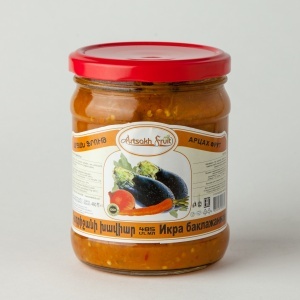 Ingredients: Aubergine, onion, carrot, pepper, salt, tomato paste, vegetable oil, sugar, spices. Lecho is a classical Hungarian cuisine. Lecho could be eaten both cold and hot, you can also add lecho to a variety of salads, hot dishes, served with meat products as dressing, and also it can be eaten on its own. Ingredients: Tomato, pepper, onion, greens, vegetable oil, water, salt, spices. Tomatoes are admired by the French who characterized them as “an apple of love”. Paradoxically, the theme of love was referred later in the 20th century medical discovery. It has been proved that lycopene, which is contained in tomatoes, dramatically reduces the risk of prostate cancer, so important for men’s health. 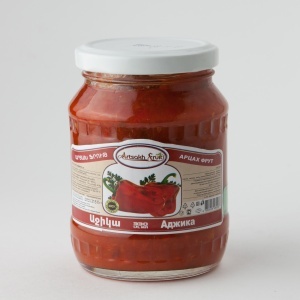 Evaporation of tomato juice leads to increased concentrations of lycopene, multiplying its medicinal properties. The legend tells us that after tasting this dish, a certain Imam fainted with delight, and waking up, demanded more of the delicious food. If it struck Imam, who was accustomed to feasts and pleasures, then it is bound to surprise us with its amazing taste. Just do not faint! 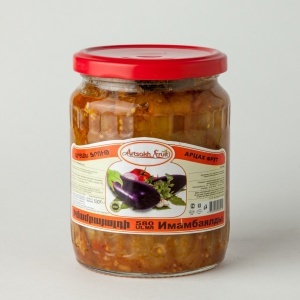 Ingredients: Aubergine, onion, tomato paste, garlic, vegetable oil, salt, spices. Adjika helps digestion, stimulates the appetite, making food more fragrant and tastier. Also, due to its composition, it strengthens the body’s defenses and kills harmful viruses. Periodic use of adzhika strengthens the immune system and allows the prevention of respiratory diseases. 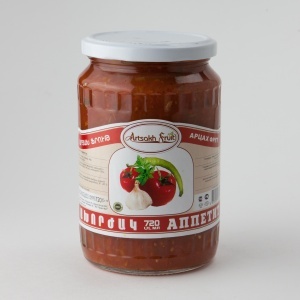 Ingredients: Red pepper, tomato paste, garlic, salt, vegetable oil, spices. Stuffed peppers with vegetables – delicious low-calorie, healthy vegetarian dish and bright decoration for your table. Sweet pepper – beloved by many, is a vegetable that has a savoury taste, is composed of a sufficient number of useful elements and is one of the most useful vegetables for health. 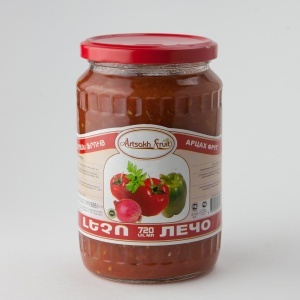 Ingredients: Carrot, tomato, green pepper, onion, sugar, salt, vegetable oil, spices. “Appetite” or Armenian “Ahorzhak”. The name speaks for itself – the smell of this product alone already excites the appetite. This is delicious! Especially for those who like spicy food. Suitable for meat, potatoes, pilaf. 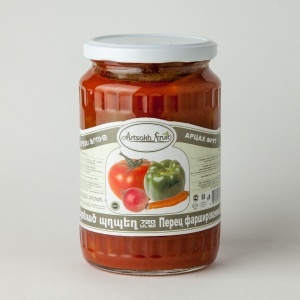 Ingredients: Tomatoes, pepper, greens, salt, vegetable oil, spices. Green beans prized for its unique ability not to absorb harmful substances from the environment. Always remains environmentally friendly. It contains few calories and is easily digested by the human body, and it is an excellent source of energy. Ingredients: Green beans, salt, water. 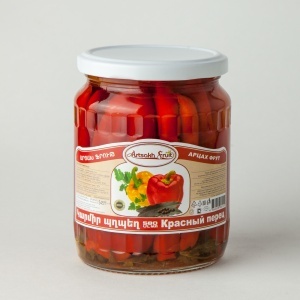 Rich chemical composition makes pickled peppers highly valuable product with important medical value, because it helps to overcome various kinds of diseases. For example, lack of energy, depression, diabetes, hypertension, edema and anemia. And also it has the property of increasing appetite. 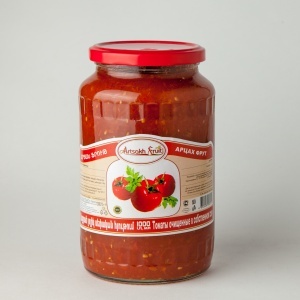 Ingredients: Red pepper, vegetable oil, acetic acid, water, sugar, salt, spices.